Fairhaven Health's Nursing Time Tea! Overall I really loved the tea! I mainly drink water but I love tea and this gives me a chance to get my tea fix while helping my supply and getting it without the caffeine! I nurse twins who are eating more and more solids everyday and nursing less so I am always worried about my supply and not being able to keep it up enough to nurse them until they want to stop! This tea helps ease my mind about that somewhat and honestly has helped my supply more then I though it would! I am able to nurse my girls and still pump some extra for me to donate! I would highly recommend this product to others who are looking for a way to help their milk production! Back of the bag of Fairhaven Health's Nursing Time Tea! When it comes to the flavor of the tea it is very difficult for me to explain. It is a very light flavor. Not really a lemon flavor like it says, there is a tiny hint of lemon but also a hint of licorice as well. Not so much that it is nasty or overwhelming though. Honestly it mostly just tastes like a mix of herbs. Again it is a very light flavor which I like more instead of a strong overwhelming flavor. 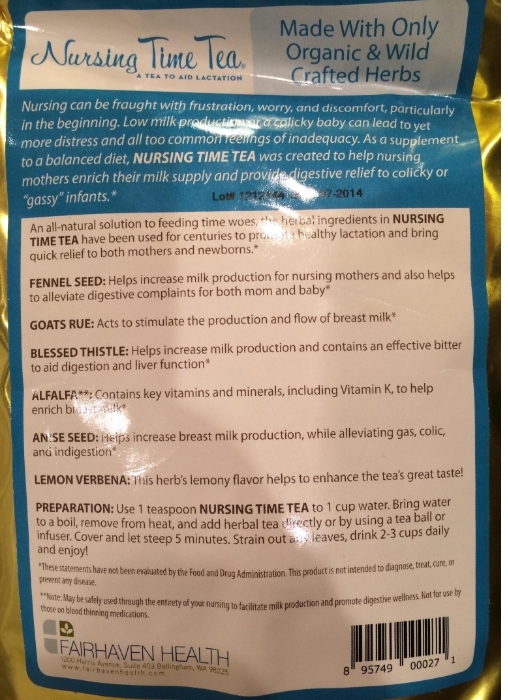 Take a look inside the bag of Nursing Time Tea from Fairhaven Health! As for the results of seeing a difference in my milk production, it took a couple days for me to start noticing anything but eventually I did see a slight increase in my production. I saw the biggest increase in my production if I drank the tea, waited just a couple minutes and then pumped. If I drank the tea then pumped a couple hours or so later I did not see as much of an increase. To me, my milk also looked a little more fatty then normal! My girls are 9 months old and have reflux and are naturally really gassy babies. I did not notice any difference in their reflux but their gas did seem to go down a little. Not a whole lot but some. I wonder if it would make more of a difference in younger babies? Left is a pump after nursing without the tea and the right is a pump after nursing after drinking the tea!! Order Fairhaven Health's Nursing Time Tea for yourself HERE! !